So many zombies were slain with these! The Sega Dreamcast had a wide range of peripherals, from fishing rod controllers to maracas to arcade sticks. One of the most popular of these was the Dreamcast light gun. These peripherals gave gamers a toy gun (shown on the left) with which they could shoot at targets on the screen. Light guns were common on games consoles until the advent of flat-screen TVs made them difficult to implement. Dreamcast fans particularly remember the game “House of the Dead 2” as a stand-out Dreamcast light gun title. You can play light-gun games in some Sega Dreamcast emulators. Typically, the mouse is used in place of a light gun. You will need a mouse with a scroll wheel for most games. There are a number of PC light-guns on the market too, usually these emulate the mouse, so the mouse pointer simply goes wherever you shoot on the screen. Unfortunately there’s no way to use two mice/light guns for some two player action in any Dreamcast emulator that we are aware of. 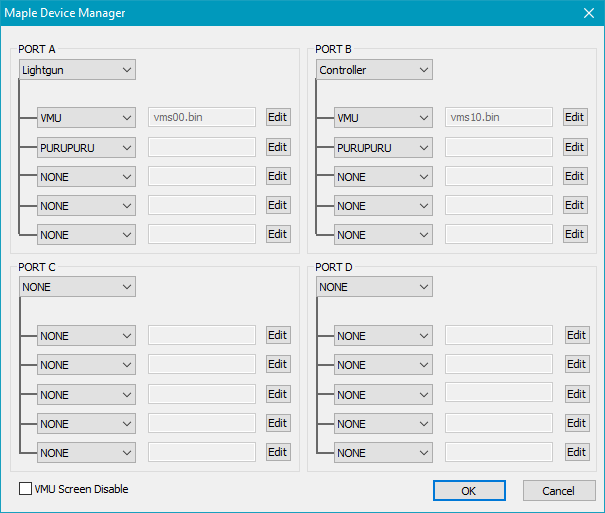 To play a light gun game in Demul using a mouse (or a PC light gun that emulates a mouse), first start the emulator, then click on the “Config” menu and choose “Maple Device Manager”. The window shown below should then appear. Make sure that PORT A is set to “Lightgun”. If you want to save your progress, don’t forget to insert a virtual memory card (VMU) into the socket too. Click on “OK” when you are done. You now simply need to start the emulator. No other controls need configuring. The Dreamcast light gun featured a D-pad built into the hardware for navigating the menus. If you have a scroll wheel mouse you can use this to emulate the D-pad. Clicking down on the scroll wheel will press Start in the emulator. To pull the trigger, click the left mouse button. Before you play your game, you should make sure to “calibrate” the gun within the game. Usually this is in the options menu. See the instructions that came with your game for more information. Crosshairs are not displayed – If you can’t see a crosshair image for your emulated light-gun and you don’t know where you are aiming, press the F11 key and a small triangular shaped cross hair image should appear. Demul won’t recognize/register my mouse as a light gun at all – Firstly, double check that you set PORT A’s controls as “Lightgun” in the maple device manager as described above. If the mouse is still not recognized, make sure you upgrade to the latest version of Demul (Demul x86 v0.7 Alpha BUILD 221215 at the time of writing). Support for light guns in earlier builds of the emulator seems patchy at best and may simply not work.